Need to rent or hire an IT training classroom in the Denver metro area? We would be happy to rent you one of our computer training rooms in Lakewood, Colorado, a suburb of Denver. Our largest room can accommodate an instructor and up to 15 students at one time. 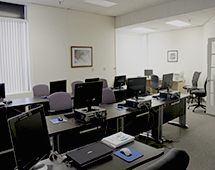 > The rooms come equipped with laptops, including one for the instructor. The instructor's PC is attached to an overhead projector. Our computers have Office 2010 on them and internet access. We also have wireless internet running in the office. > Our office is newly renovated and has a nice pleasant feel to it. > Our location is great - we are centrally located in the metro Denver area and next to the busy 6th and Union Lakewood central business district. Click here for Directions. > We have a fully stocked refridgerator with drinks and lots of coffee. We charge $150 per day for the use of the room. If you want us to configure the laptops for your particular needs, let us know. Depending on your request, there may be a setup fee equal to $90 per hour for the time spent configuring software. Call our office manager Jo Johnson at 303-908-5605 if you would like to discuss your needs further.